Is Gold worth Buying ? To understand this Study, we have to go back to years when human civilization started. Surprised! But yes, lets go back to those times where human civilization just started. Those days, economic activity was bare minimum and there were few trades between humans. For example, if a farmer wanted to build a home, he used to give some quantity of grain to carpenter, plumber etc and that system was called BARTER SYSTEM. So goods itself were basically used as currency. Economic activity grew and then emerged an alternative currency which was in the forms of coins and we had what is called ASHRAFIYA. We had gold, silver and copper coins which were used as currency and it was Emperor who used to control the currency system. Then economic activity picked up further and since there was a limitation to the amount of gold, silver and copper we had, Paper currency emerged and till date such currency is the main form by which we all trade. Though now-a-days, we are witnessing another form of currency which is called Plastic Card Currency/ Credit Currency which if not used judiciously, can be a disaster. In fact,the entire US came to a halt in 2008 as credit currency was mis-used to unimaginable extent. Today also, each emperor (so called Government) produces and controls their own currency as DOLLOR, Rupee, Dinar etc. But internationally, gold still remains the purest form of currency as it cannot be manipulated. Now in paper currency world over, Dollar became the most acceptable currency as US economy is still the biggest and almost all countries trade with US. After US dollar, the most acceptable form of currency is GOLD. If you have gold and you are not carrying dollar, you can still buy items in any country of the world but you cannot do so with Indian Rupee. Hence, in economic terms, gold is a currency. Gold is a recognized international currency and currently Dollar is the most recognized Paper Currency. Hence gold is valued in terms of Dollar and not in Rupee. 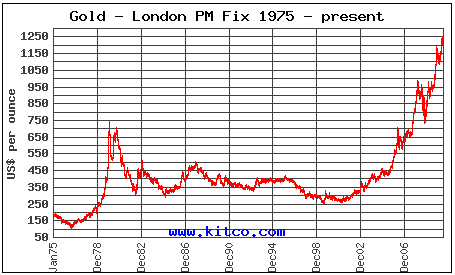 Now if we go back in the history, in the year 1976-81, gold had a dream bull run. From $100 per ounce in 1976, it had gone as high as $850 per ounce. That rise took place as people feared that US economy would collapse and $ would have no value. That time, US was in war with Vietnam & then came Iranian Revolution – inflation in US was at very high levels and in a way, there was hyper-inflation. Once the war was over and inflation eased out, Gold came crashing down. In the year 1990, it was $400 per ounce and in the year 2000, it was close to $250 per ounce. That means the effect of bubble was so big that even in 20 years, the gold could not recover its original price and was languishing at less than 1/3 of its peak price. So please don’t be surprised if you will be able to buy gold again at levels of Rs 10000-12000. Now, Dow Jones was at 10000 in the year 2000 and today also it is at same levels. The US economy is in bad shape and in last 10-12 years, it has not really made any significant progress, rather its debt is so much so high, that there is a fear that US would only have to print further paper currency i.e., dollar either to repay the loan or to keep in the economy going. The moment any government print notes without significant growth in the economic activity, the currency loses its value because of high inflation as same quantity of goods and services are being chased by more money. Anyway, US government is printing billions of dollar just to keep the economy afloat. In the year 1980, $1 was equal to Rs.8 and today as we are writing this article, $1 = Rs.46. Dollar has appreciated more than 5½ times in last 30 years. In the year 1991, there was a time, when Indian government was literally bankrupt and they had to devalue INR more than 25% in just a single day, just to repay the debt we had. That was the time, India was liberalized and government opened their economy and allowed foreign companies to do businesses. Since then, India has grown dramatically. The fact of the matter is that in the year 1991, sensex was close to 1000 and today it is at 18000. As Indian economy keeps rising and US economy keeps doing down or at the max stands where it is, the likelihood is that dollar should depreciate. In the year 2007, dollar had depreciated to as low as Rs.37. Gold was Rs.1450/- in the year 1980 and today it is Rs.18800/-. The rise of 13 times in last 30 years @ 9% p.a. But 5½ times of such rise is on account for Rupee depreciation in terms of dollar. So if we were to analyse the rise in gold price in relation to rupee alone without taking dollar factor, it is only 2.35 times. You see, even in terms of dollar, gold has risen only 1.5 times in last 30 years. What can happen in future? If dollar in comparison to INR were to stay at the same level of 45-46, then there is a likelihood that gold may rise further. If due to the sheer strength of Indian Economy, dollar flows to India by way of FDI, FII etc continues, rupee would strengthen and that would mean that even if gold were to rise in dollar terms, it will still decline in rupee terms. In fact, as it happened from 1980 to 2000 that gold kept going down in dollar terms but since the rupee was depreciating in dollar terms, the gold kept rising in Rupee terms. The reverse can happen now and gold may decline in rupee terms. 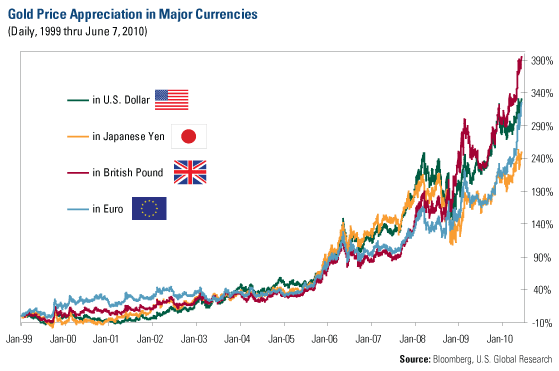 Basically, the price of gold depends on currency movements; for example, in Yen terms (Japan) gold have moved 240% & in Pound terms (Britain) 390% in the same period (Check below Chart). We always used to suggest investors that gold is not an investment, it is an insurance which would save you in case the entire financial markets were to tumble down. The live example is that of Zimbabwe where, paper currency has lost its value and if you are holding paper currency, it is depreciating at a rate which is unimaginable. You have to carry crores of Zimbabwe currency just to buy a loaf of bread. Now if you are holding gold, you can actually buy or barter goods there. At least, you can go to neighboring country South Africa and buy what you want as gold is recognized everywhere. Now, if an average Indian household were to look at their asset allocation, they already hold more gold in the form of jewelry or otherwise than they hold Indian equities. In fact, Indians are the biggest consumer of gold. One must consider gold as part of asset allocation tool and over-boarding on it may not be that a great idea. It may happen that in short run, gold may give better returns but mind you, it is Indian equities that will create a long lasting wealth for investors. In October 2009 when Gold was $ 1072, Bloomberg made this statement “While bulls say gold is cheap, the inflation-adjusted price is 15 percent above its 30-year average, Bloomberg data show.” First time in 100 years gold has touched it’s inflation price – what will happen next? What they meant is that it is for the first time that gold price is above its inflation-adjusted price which clearly states that gold is over-priced as it is a sheer currency and nothing else. The following are Google trend charts. It analyzes a portion of Google web searches to compute how many searches have been done for the terms you enter, relative to the total number of searches done on Google over time. This clearly shows that people start searching for investment which have gone higher in recent past. 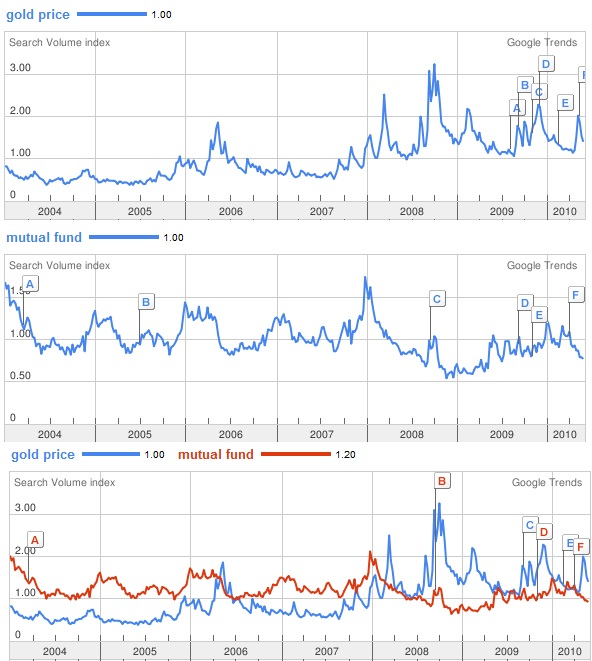 Check 2nd Graph of Mutual funds which peaked in December 2007 when equity markets were also at their peak. No one was searching for Mutual funds in the end of 2008 or start of 2009 when actually it was the best time to invest. Upto 2007 end when it was best time to invest in gold but no one was searching for it but when price went up, the number of searched went up. This is a guest article by Hemant Beniwal & Ashish Modani. They both are CERTIFIED FINANCIAL PLANNERCM & writes at The Financial Literates. Excellent work! Once my teacher at a coaching institute was telling us that if Dollar goes up then Gold price goes down but I could not figure out why Gold still be going up in India. Thanks to this awesome article I am able to figure out why. “equity is the mother of all investments”. thats a old line used by anyone whose life depends on peddling equities.gold is insurance.against the govt.against paper money.if the govts of the world were fiscally prudent ,gold would actually drop in price. in a gold standard era,gold would actually be a poor investment. it is only because the path govts and central banks drunk on keynesian and chicago monetarist ideas,have charted a path to destruction of paper currencies of today(nothing new,this is a historical cycle) that gold is today a superior investment.not that equities are bad,but debt? especially so called gilt or sovereign debt? thats toxic. Yes , thats a 2 yrs old article , and apart from saying why you should invest in Gold , it also tells you various ways to invest in gold . After reading this article and yours, i’m very confused. Are they both just opposing views, or is something that i’m missing? Hemant , can you follow on this comment by Venkatesh ? That talks about gold in dollar, we are concentrating on rupee. Both articles are using different data time-line. I would again like to clarify that we are not predicting anything. “one of the world’s most highly regarded asset allocation specialists, determined that holding between 7.1 percent and 15.7 percent in precious metals bullion reduces portfolio volatility and improves returns.” Quote from your article link. Informative article, quite contrary to the general belief about gold. We indians don’t look at gold that way. For us, specially ladies it still is an emotional investement. Diversifying a portfolio with reasonable % of gold that too after trend-study..many will not be comfortable. We are yet to adapt ourselves with something called gold ETFs. Buying ornaments and keeping them is simple, it gives feeling that we are holding something precious which is valuable too, that value too depreciates..no one gives a second thought. I think there is no reason ladies should buy ETF’s or think about gold as an investment , for them as you said its something which they cherish to have , and thats enough to buy it , even if it does not increase in value , because its value is not in how it grows in price , but how happy you are wearing it or owning it , thats the motive of buying anything or to do anything in life . Thanks Hemant for this informative Article. I was aware of the Dollar and gold inverse relation but not knowing how exactly it is. Now I have a clear idea about it. Very nice article with so much of deep analysis. Hats off to your detailed research on the article. After reading the article most people will shun gold and go for equity investments. Just to look at buying gold from a different angle. This is for parents who buy gold for their chidlren’s (mainly daughters) wedding. For them buying gold is more of a compulsion for the marriage than buying it for investment purpose. In an average Big Fat Indian Wedding parents buy about 25-30 (not sure of the exact figure) tolas of gold. So if a daugther’s father has to buy 250-300 grams of gold at today’s prices it will cost him 300*1800 = Rs 5,40,000. Now if Rs 5.4 lakhs is spent only on buying gold then how will the father take care of the other expenses related to the daughter’s marriage? So this point also makes a case for people to invest a small portion of their portfolio in gold ETFs. Through ETFs a person can accumulate as low as 1 gram of gold a month. So when the daughter/son is born the father can start accumulating 1 gram of gold every month. In 300 months (when the daugther turns 25 years old) the father would have accumulated his target of 300 grams of gold and get his daughter happily married without burning a big financial hole in his pocket. So Hemant buying 1 gram of gold every month through ETF can fit in your strategy of having 10% of the investment portfolio in gold. Please let me know what is your opinion on this. Thanks Gopal for your views. I agree with you; it’s a good way to systematically purchase gold. But I am not a big fan of Gold ETF due to it’s expense ratio of 1% & in some cases close to 2%(plus demat & trading account cost). It’s too much for Asset class which will deliver returns in range of 6-8% in long term. Better one should buy it from their trusted/regular Jeweler. Till now, i was wondering why people never see gold as a currency and its relation with dollar and rupee. This article has thrown lights into areas like this which many people don’t bother when buying gold. Honestly Manish, I have seldom seen an article which says don’t buy gold. Its a very nice read at http://money.outlookindia.com/article.aspx?266215. Interestingly, the April 2009 Outlook Money issue had a similar story to tell. Its at http://money.outlookindia.com/article.aspx?91576. nice links , I saw that the first article tells us about the relationship of Gold with Dollar , good one . Very detailed and informative article. I agree on the facts that the way to buy gold is via ETFs and bars/coins. While this is to be kept at a max of 10% as Manish mentions, its a known fact that bar/coins from banks come at a premium and so should be avoided. Instead, bars/coins from reputed jewellers should be bought. Congrats Hemant for the detailed graphs. I agree with you and Sathya on one important point – the fact that we Indians want to invest in something more tangible – gold and real estate. The recent Outlook Money (July 14th) talks about Gold in detail for those interested in more ! Great .. I will check it out .. Did the article in outlook money favors buying gold or not ? a must-read before investing in gold! manish echoes my thoughts on sentimental value regarding gold! peops have a notion that gold is far more secured as compared to equity/sensex! but, if we dig into the uses of gold……..do we have many??? or is it only a luxury good, when it comes to uses??? It is true that equity has given more return then any other class. But the main fear is that we don’t know how long crude oil will be available on earth. This seems irrelevant, but if we imagine that there isn’t any amount of crude oil is available then we are not ready with other effective alternatives. Today, whatever is we use in our life is however produced by use of crude oil. If that will happened then industries will stop functioning. There will not be any value for any paper money or equity. And only medium for trading will be metals (Gold, Silver, etc). We know that one day this will happen but not sure when. I am telling this because when we think about long term investment we should consider other situations which might occur. I would disagree about the long term implications of fossil fuels or any other entity on equities on so massive a scale that it would cause equities to cease to be the foremost investment vehicle. The root of the matter is that equities represent economy at large and the economy/business has always been and will always be. If the world comes to a point that there is a severe repercussion of certain events (fossil fuels going extinct or something) on the global economy of unprecedented proportions, then god help us all, no amount of gold, silver or any other assets will save us. Man has adapted and evolved over the ages and that will continue to be the case. I am sure we will tide over all such eventualities over a period of time. Equity, in my opinion, will continue to be the foremost investment vehicle. Really very – very great work. I am reading your blog since 3-4 days. Really all articles are very much knowledgable, accurate and based on fact. I really appriciate your work. You are playing a very big role in the financial development of Indians as well as country. Could you pls tell me how much % of portfolio should be invested in Gold? Is Gold ETF better option for investment rather than physical Gold? thanks 🙂 . Gold can form upto 10% of your portfolio . Gold ETF and Physical gold have their own advantage and disadvantages 🙂 . while if you are looking for pure and pure value appreciatiion and less hassle , you can buy Gold ETF . Manish also would love to see a similar post/topic regarding silver…. As I have read at many places silver to get extinct in next 20-25 years driving price upto 36k dollar per ounce …. I Love it, i can now argue with ppl to not buy GOLD. I was fighting without any solid argument all this while. Now i can back it up with facts. Your point is that “other things can be responsible” is something which investors rarely understand. Even in case of Gold, investors are only seeing the price movement and are being carried away by that. One must look at different angles. But Equities to us remains the MOTHER OF ALL INVESTMENT. In fact, all asset classes are linked to Businesses. Real Estate derives its value from it. Delhi’s land is costlier than that of Jaipur as business is more their. So guys, starts understanding businesses and you will understand other investment automatically. Real estate is so much different game altogether .. People if think more clearly , they will realise that commercial property can be a better deal if they really want to give things on rent , but still people buy residential property and give on rent. Books for CFP no chance!! Hemant has done a good work on this article, the best part is connecting all the dots to show the real situation with gold . Nice post, Hemant & Ashish. Thank you. Shubra has been saying the same thing in his cynical , convoluted and ‘I know better than most people’ way. Your article puts things in good perspective and will reach/appeal to more people. Your views are really valuable to us, as you are way ahead on ladder of Financial Literacy. Everyone was saying buy gold & we just thought why don’t give a different perspective. Quote “But 5½ times of such rise is on account for Rupee depreciation in terms of dollar”. Does this include the two times government purposefully devaluated INR against dollar in mid 90s? opps! missed it. my apologies for the question. I have seen a tendency that whenever the world faces a financial crisis, people turn towards gold for the rescue. At present the risk/return ratio is not on our side. Risks outweigh returns by a considerable margin. Yes, gold prices might go further up a bit, but I think the pressure should ease up once international markets stabilize. This pressure could again build up when the so called ‘baby boomers’ become eligible for their social security(or watever they call it in US) because US is already in so high deficit which will give rise to fears of US defaulting. Asset allocation is the most important part which this article specifies clearly. For an Indian marraige, 300gms of gold is reqd which you should buy and keep or gold should be 2-3% of your portfolio, whichever is higher. 2. May be IMF foresaw the euro debt, so they decided to sell gold n make money. 4. May be we indians prefer something more tangible than paper assets. I think the main reason should be, in Gold there is no option for the buyer, whereas in equities buyer is spoilt for options. May be we are not much comfortable choosing one from 1000 of options. A. In past economic events were big indicators (like relay race – baton will be passed & 2nd person will start running) but now a day things start moving before actual event occurs. Gold is rising from last 10 years in anticipation of a big event. B. In any asset there are two type or returns Fundamental & Speculative, In case of Gold it seems that Fundamental Returns has come & now it’s in a territory of speculation. I reserve my right to be wrong. “Once Indians start selling gold at its highest price, China will start buying the whole of it.” I think Gold will not look good on their skin 🙂 . Hope this comment in not racist. “May be IMF foresaw the euro debt, so they decided to sell gold n make money.” Poor timers 🙁 our retail investors are smarter than them. “May be we indians prefer something more tangible than paper assets.” I agree to this be it gold or property. A. I think investors understood the ball game when the dot com bubble burst…from that point onwards investing towards the real currency started. B. Do the gold ETF really buy the amount of physical gold and keep? I doubt…that means wat happening is speculation. Sathya I am not sure if you are asking or telling , but as far as i know , Gold ETF’s buy the real gold and keep it with custodian , and the price of ETF depend on that gold price . I read an article where it said silver has more industrial uses and its reserves are lesser than gold reserves right now. I dont know how trustworthy the article was. But will dig deeper into it. If the article is genuine, then silver prices should be more than gold and wats happening is speculation. I would like to know more about how an ETF functions like the managing part of it. I think what he has mentioned is correct , however the fanatic behaviour associated with Gold will not reduce and only investors who can go beyond their control and mind can make great use of potential which might lie with silver . This is more like the ULIP frenzy. People will buy what they r offered and advertised heavily. I find every major fund house opening a Gold ETF. Well cant blame them also, they r following ‘We should sell what sells in the market’ philosophy. It states volumes are not much in case of ETF’s…What will happen which volumes start increasing in the case of Gold ETF’s? ?as in volatility will increase/decrease? I don’t want to demotivate you but if you are an investor you are on the wrong track. Investors need to keep thing simple but your comments shows that you are stuck in the complex web of information. I just read it once till now.. & i feel there are many things to learn from this article…. The points that are covered in this article is just superb…..instead of theoretical points you have tried to make use of practicality too, which is very cool. Will need to read it many times to learn things frm here..
It’s good to hear such comments from a finance geek. We in fact took long time to write this article as we were looking for something of Jago’s standard. You have set a new standard yourself. Now, manish will have to raise his standard!!!!. Everyone is ready to convince you that gold price will only go higher but we just want to say – gold should be small part of your asset allocation and the reason of buying gold should not be rise in price. We will love to discuss anything related to Gold. Asset Allocation can be seen at 2 layers one at net worth(this also includes your investments) & second at investments. People need to strike proper balance in both the layers. My understanding was investment is sub-part of Net Worth (and not separate). But that’s OK because I think I understand your perspective. In the context of financial planning, what are your thoughts on how to strike this balance on investing layer (i.e. my earlier question 2)? How to know what is balance? What investment vehicle? What cost/print point? My question is generic and hence not looking for “depends on individual situation”. Qualitatively, it is always easy to say “strike balance” but, I continue to struggle with this non-actionable framework of striking balance. If you think comments section is not a right place, a separate article may be a good option to present/discuss a generic frame work for gold as an investment layer. On one side, I want use Gold in my investment layer, but cannot understand full chain, valuing/buying/holding/selling, etc… ? If your question is generic, you must know the answer – but it’s not Generic. Think!! I hided 1 layer in my last comment (to keep things simple), this layer is YOU. Say if someone is working with Government organsiation he is a GILT(100% safe) so he need or can have more risky asset to strike the balance & vice versa in case of businessman(depending on his business he ranges between bluechip stock to small cap stock). But normally people who don’t understand risk(95%), don’t consider this point. Striking asset allocation balance depends on the individual person but will try writing an article is a good idea. One more thing – let’s try to understand it through analogy. Consider a person who consulted doctor for some disease. The doctor will not recommend a medicine based on the patient’s familiarity with various prescription drugs but still doctor will take care that he is not allergic to any particular drug. It’s bit different in case of Financial Planner (Sometimes even doctor’s do this if required). In case of Financial Planner he will find out the allergy of investor but before prescribing assets he will try to solve the allergic problem. “On one side, I want use Gold in my investment layer, but cannot understand full chain, valuing/buying/holding/selling, etc… ?” Proper Asset Allocation & rebalancing will solve this problem. First of thanks for publishing our article once again. I was out for couple of days and just could not participate. As far as your point on speculation in concerned, I would only like to say that investor at large have a problem of identifying themselves. The same question, we also ask investors – who you are – an investor or a trader. Mostly what happens is that when Investor buys an asset and it rises, the person who has bought becomes trader and sells. But if the asset price has gone down, he becomes investor and wait untill the price recovers. So to people at large who are not that Financially savvy and/or dont have much time, the advise is that they should avoid speculation. Though we believe more on fundamentals and less on technicals. Do you see this in all the products including Mutual funds , shares , Insurance (LIC) ? The point is true with all asset classes but specially when it comes with asset which are market-linked as people think that they are for short term. Not many people dump their endowment or money-back policies. They just hold them till the maturity. In fact, most of the investors are not aware of what is PAID UP provision in case of insurance. They believe that once they have signed for a 20 year policy, it is mandatory for them to pay all the premiums. In fact, agent tell them like that only. Not many people hold their shares and mutual fund for a long time. Other day, i had gone to Reliance Mutual Fund Office when they were celebrating 14 years of Reliance Growth and Vision Fund. I asked them, give me list of even 100 investors who have been holding these funds since inception. They just did not have an answer. Thats the punchline we use for educating clients. Thats the crux , most of the people do not understand problem of Debt , so all the people who are into Endowment etc , they will not come to know about the erosion of their worth , they will happily fight with you on the increase in their money . Love the point, “investor by COMPLUSION and not investor by CHOICE”. You hit the nail on its head. Thanks Manish for publishing our post, coincidentally today it is First Birthday of The Financial Literates , our blog . I would also like to thank you for your support & guidance in our blog. Congratulations to you on completing one year. Clicking your link opens up a broken link error message. I wonder if it is only me or the site is down or something.